Still no answer for David. We all came to the conclusion that we should wait in Chengdu until either he was flown out of there, or until his wife managed to get into China – it was not possible for her to fly immediately, since it takes a week to apply for a visa. Jon had managed to track down some springs that were softer than the ones he needed, but would at least fit (and that were still in one piece, a vast improvement on his current set-up). After that we came back to the hotel and did internet-chores – BORING!!! Finally… finally… – IT WAS TIME TO SEE THE PANDAS! We found some good advice online as to when was best to visit these creatures – the trick was to get there right when the park opened to catch them during feeding time and before the bus loads of tourists arrived. We were lucky with the weather and arrived to a very humid, but not raining Panda Research base at 8am. The pandas slowly got out of their indoor homes to stretch their legs and more importantly get to eating some delicious bamboo. Too cute! The research base is home to Giant Pandas of all ages (including a new born still in an incubator) and also Red Pandas, who were very active after the feeding time. We took tons of photos and videos of the animals before we departed the base late morning. Since this was the first dry day we had in Chengdu, we took the opportunity to do some work on Ivor, including sealing his leaking windshield, and some patch ups on the box that had developed a few blemishes on the outside. Nothing half a cartridge of Sikaflex couldn’t patch up, but still worth getting fixed while we had a chance – we were heading towards South East Asia just in time for its famous monsoon season after all. As for David, he received the news from his Insurance company that they wouldn’t fly him home for his operation, but that they may pay for the surgery in China. Ridiculous! 4 days had passed with no formal decision… Needless to say, everyone in the group looked very closely at their travel insurance policies. With Lun in the passenger seat, we drove to where we had parked David’s bike 4 days earlier, to find it was still safely parked there and we spent the next 3 hours or so preparing it for shipment (removing all fuel), arranging the shipping company, then waiting for said company to arrive to collect the bike and accessories. The time spent waiting was not wasted, we did have lunch and watched a group of older folks playing cards in a very animated way – slapping the cards down as hard as possible in an effort to intimidate their opponents. With David’s bike on its way to Kunming where we would meet it a few days later to arrange the onward shipment, the last 2 tasks for the day should be a breeze! Clive took a taxi out to our hotel to meet us for dinner at the duck restaurant Lun had spotted earlier. Unfortunately, when we go there, they had already sold out of ducks! So, back in a taxi we all got and headed to the city centre in search for other eats. This wasn’t too difficult, and luckily the restaurant we chose, there were some friendly locals who took an interest in us and who also offered some advice as to where to go for a night of dancing and fun. Turns out, there were 2 nightclubs in the vicinity of the restaurant, so the locals’ advice was to just pick one of the 2 which had air conditioning. Normally, the advice on a nightclub you would hope to get would be in relation to the type of music playing or the type of people attending, but the reason for the air con advice was to become very very apparent. On entering the nightclub, there were a fair amount of people, but it definitely wasn’t overcrowded. The first 30 minutes stayed like that, after which hoards of people arrived to dance the night away, which lead to a very very hot and sweaty club. We had a great time dancing and making new friends in the bar. There was a good mix of locals and tourists, everyone just enjoying themselves. We danced the night away, had a cheeky burger in a neighbouring restaurant before heading back to the hotel in a taxi. For some reason we were lacking a little enthusiasm for the day, so after the hotel breakfast we dragged ourselves to a hangover friendly lunch at pizza-hut. We were feeling pretty lame for taking the western option, but sometimes you just need a little comfort from home! That was pretty much it for the day save some internetting back at the hotel and a restaurant just up the street – where our random finger jabbing at the menu came a-cropper once more. The bowl of chopped chilies and the bone filled chicken laid on the table in front of us was just mind-blowingly hot. We managed to pick out some edible meat, but the little green devil vegetables had us sweating. With reddening faces we ordered a veggie dish to dampen down the flames and the waiter also brought us over some tasty soup with the compliments of the house. A well needed early night followed shortly after. 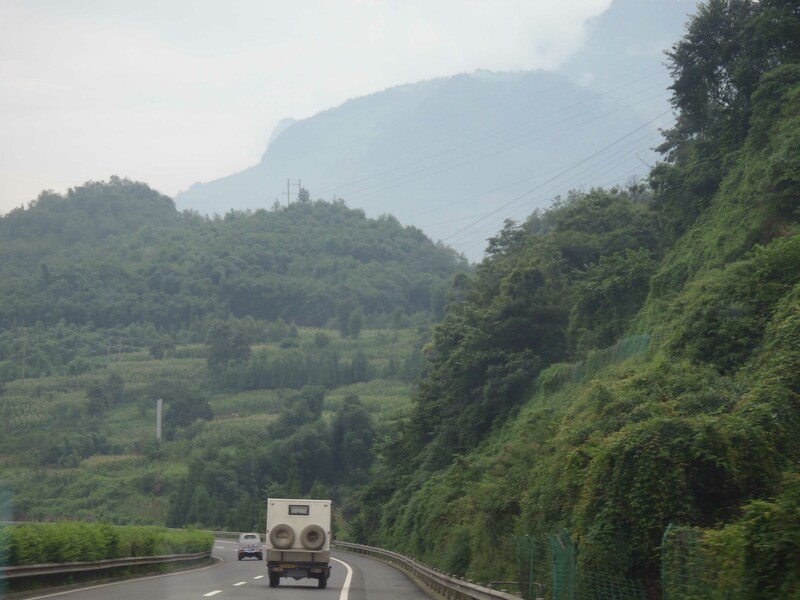 Couldn’t really believe we were still stuck in Chengdu, and more to the point – what the hell was David still doing there?! We went to visit him in hospital, and during our attempts to find him had first wandered into the general reception area – that was a big mistake, just 4 floors of utter chaos where people with all sorts of ailments and their families were trying to get some kind of aid. Over the course of the week David’s insurance company had taken some kind of responsibility for his rehabilitation, and had transferred him to the VIP ward – where he had his own room and a nurse to look after him. He was in morphine induce good spirits when we did eventually track him down – heightened no doubt by the news that he had received that very morning: He would be flown that evening to Bangkok where he would receive his operation in a top class hospital. This had the extra benefit that his wife and son could come out to visit him without needing to wait for a visa application to come through. We had one last group meeting that night to prepare our departure, and a final walk around the tourist spots in Chengdu that we didn’t manage to go to earlier. Finally back on the road again – yippee!! We had some catching up to do since our schedule had been somewhat crippled by the extra week spent in Chengdu. This meant some time on the highways, unfortunately missing out some of the most interesting sections of the Tibetan Cultural Area. Anyhow, buzzing along the toll roads brought with it amazing views, and the amusing news that the bikers were not allowed to join us. It is illegal for motorbikes to use the toll roads in China, and they had managed to get away with it this far by just busting it passed the toll gates where the attendants were powerless to stop them. Today though, the police got wind of what they were up to and they were escorted back to minor roads no less than three times. After stopping in at some services for another brutal (though slightly more tolerable) hit of chicken and chilies we chugged on chuckling away at updates of the bikers’ misfortune. We racked up a fair bill on the roads that day, but it was worth it. A true case of the hare and the tortoise as we waited in Xichang for their arrival. Lun decreed that we could camp again, so we found a nice empty car park near a lake – where we were treated to a nearby firework show, and then a natural light show as the thunderstorms started to roll in. We tried for a swim in the lake before taking to the road again this morning – we gave up pretty quickly finding all the entry points either covered with reeds or occupied by fishermen. We returned to find Jon a little grumpy after a bad night’s sleep – During our prolonged stay in Chengdu we had all stayed in the hotels since it was cheap, had good internet, and outside the rain hammered down torrentially a few times a day. It was this rain that had infiltrated his roof-tent and soaked everything inside – making for a mouldy damp evening, while thunder storms raged outside. We’d had our pockets turned out at the toll booths the day before, so took to the small roads having clawed back a little margin on the itinerary. 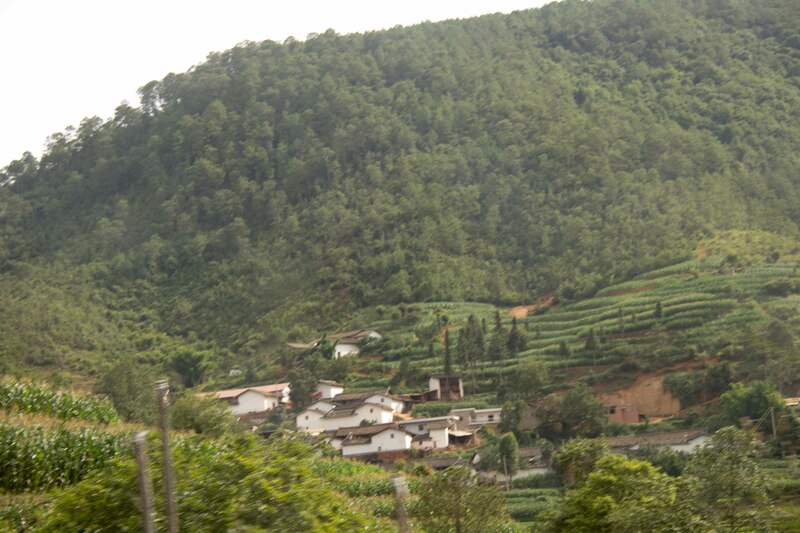 It was a far nicer way to travel, but the small roads through this mountainous area made for some very slow travel. We camped up in a picturesque spot just of off a road that wove its way up through the terraced hillsides, and made use of the time to plan a little of our onward journey. We had directed our focus so heavily on getting to China, and what happened after seemed so distant, that we had rather neglected to plot our next moves. However, this poor planning (or free spirited outlook, depending on your approach), might yet play into our hands. We recently learned that the country of Myanmar (or Burma, depending on your political persuasion) had recently opened its borders to ‘third country’ tourists (i.e. not from either Myanmar or its immediate neighbours). Potentially very exciting news – not only would we be among the very first to transit this country since the military coup over fifty years earlier, but also we would be spared the inconvenience of dismantling Ivor to load him into a container for shipping between Malaysia and India, to avoid the troublesome country. We finalised a desired itinerary and got in touch with some travel agencies to see what could be arranged.